Loving the Front Porch "Greenhouse"! Watering succulents. Any more room for plants? Beneficial bacteria growth ensures a healthy growing medium that will produce strong, healthy plants. Our greenhouses are open daily for your browsing pleasure. Tiny Padye, and Tiny Double You - great little lilies! Bursting with colour in June and July, heavy with the sweet perfume of our Oriental and Trumpet lilies in July and August, our LILY greenhouse is by far the most popular with our customers! 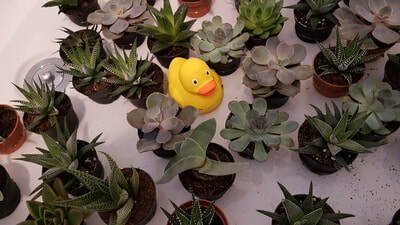 As you wander through any of our greenhouses be sure to stop and talk with our staff. 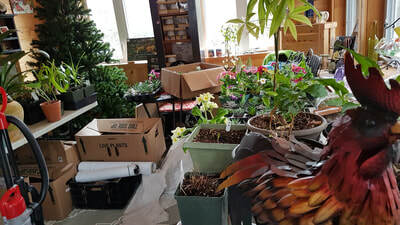 At Earthbound we are primarily plant growers. We encourage our visitors to walk through each of our greenhouses and observe how we do things. We strive to improve our growing and propagating practices and will happily discuss the latest with you. 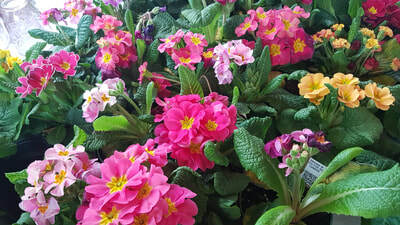 We also carry a large selections of hardy perennials, shrubs and vines, herbs and fruit plants. This year we have expanded our varieties of hardy roses.